For the avid golfer, a typical day on the course begins long before the ritual lacing up of the golf shoes, before the warm up on the range, and the stroll to the first tee. For the truly passionate player, the typical day begins at the beginning, with thoughts towards the round, possibly over that first blessed cup of Joe. From there, his day proceeds in three stages: Getting ready, playing the game, and reflection. Getting ready involves mental and physical preparation. In order to get into the right frame of mind the avid golfer will run a mental overview of what is to come. As a golf club member, this player will know the course in all its nuance and subtlety, and with that morning coffee he will visualize each likely stroke, from the satisfying thwack from the first tee to the approach over the menacing bunker at the eighteenth green. After a little stretching, a short warm up on the range plus and a few practice putts, it is time to go out on the course. Playing the game now forms the core of his attention. Focused and engaged, he has the presence of mind to look around and take in his surroundings. After all, these moments in the mild sunshine is a big reason for his having joined a golf club in the first place. But even though the amble down the fairways is a big part of his day, it’s time to get serious and apply all he has learned. The championship golf course is designed to challenge the player at every turn, from the tees, on the fairways, and at the greens. If he is to win this battle against the course, he must first win the battle within, not letting his emotions overwhelm him and distract him from the task at hand. Then, he is in the best position to use all his ability to conquer the golf course, shot by shot, hole by hole. There will be battles won on both sides, but it’s the war that the player wants to win. Finally there is the reflection. We’d like to picture our man on a deep chair, feet up by the fire, loyal hound at his feet and a hunting rifle on the mantle, replaying the day stroke by stroke. Actually he could be at the grocery store, or in the basement wrangling with the water heater again. No matter. His heart and mind are on the links. 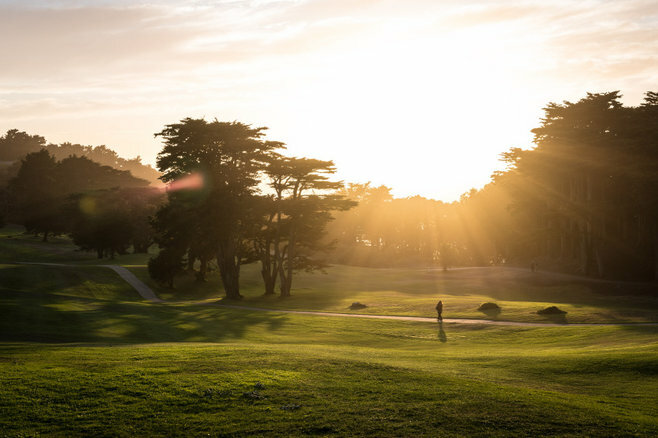 For the avid golfer, this end-of-day review is a meaningful part of the game, the quiet time spent in retrospect, internalizing the victories and strategizing how to turn around the defeats. This is all in planning for the next round, a hopeful opportunity for success. For the avid golfer, a typical day of golfing is a full day, a deep experience that enlivens and enriches every hour, creating great anticipation for the next full day of golf.